Transects that traverse substantial climate gradients are important tools for climate change research and allow questions on the extent to which phenotypic variation associates with climate, the link between climate and species distributions, and variation in sensitivity to climate change among biomes to be addressed. However, the potential limitations of individual transect studies have recently been highlighted. Here, we argue that replicating and networking transects, along with the introduction of experimental treatments, addresses these concerns. Transect networks provide cost-effective and robust insights into ecological and evolutionary adaptation and improve forecasting of ecosystem change. We draw on the experience and research facilitated by the Australian Transect Network to demonstrate our case, with examples, to clarify how population- and community-level studies can be integrated with observations from multiple transects, manipulative experiments, genomics, and ecological modeling to gain novel insights into how species and systems respond to climate change. 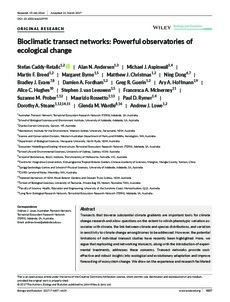 This integration can provide a spatiotemporal understanding of past and future climate-induced changes, which will inform effective management actions for promoting biodiversity resilience.